A Eye-Fi wireless flash card turns almost any digital camera into a wireless camera. This type of wireless card helped solve a problem at an Indianapolis dentist who needed a fast and easy way to take new patient photos. Each new dental patient was supposed to get their picture taken so it could be added to their Dentrix patient records. Before the Eye-Fi wireless card they were forced to turn off the camera, take the flash card out, place it into a flash card reader, copy the files, then go back to Dentrix to add the patient photo. With the new Eye-Fi wireless card they now take the picture and go straight to Dentrix to add the photo from the network drive. Now new patient photos actually get taken because there are less barriers to the process. This is just one of the ways you can use this type of technology, but it’s not without some issues. During a recent Windows Update, Windows DNS took over the communications port used by the Eye-Fi transfer software. 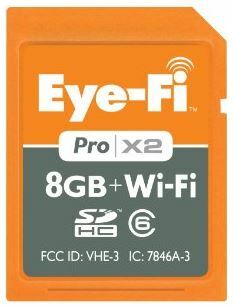 After reviewing Eye-Fi Support, I found that the Eye-Fi wireless card communicates on port 59278. Windows DNS had taken over that port and Eye-Fi stopped working properly. I edited the Registry to exclude port 59278 for use by the Eye-Fi. This change only takes effect after the computer has rebooted. Occasionally more Windows Updates would occur and this process would need repeated, but it’s since stayed working for a while now. Make sure the computer is logged in and that the orange ‘wi-fi’ symbol in the lower-right system tray is running. Dentrix does not require the server to be logged in to run, but the program that captures pictures on the network (Xfi) does require it. If Windows is logged in the program may not be running for some reason. Attempt to start the program from the Start menu. It will either start or give an error message. The worst case scenario is that you’ll have to manually copy files over using the media card in the camera. The DHCP server that hands out IP addresses can become full and stop handing out IP addresses. This can happen when wireless access points share DHCP leases. The Eye-Fi camera card attempts to get a new IP address every time the camera turns on. If it has no address, it can’t communicate on the network. This issue can be fixed by a) deleting all the old instances of DHCP leases b) expanding the total number of IP addresses allowed in the DHCP range and c) restricting the number of days an IP address exists from the default 8 days to 5 days. This same issue would also prevent new mobile phones and tablets from joining the Wi-Fi network so that could also be a clue as to why the Eye-Fi card can’t connect. My name is Erich Stauffer and I am a local IT business consultant who offers dental IT consulting to dentists in the Indianapolis area. I specialize in Dentrix, but have clients using Soft Dent as well. Most of the time issues are related to technology, which is why I am a Microsoft Certified Professional with A+ and Network+ certifications to back up the years of experience I have serving small business customers in the Indianapolis area. If you’re interested in a free consultation or technology review, please contact me.